Monday 11 AM: MIT App Inventor. Sharing allows you to build a QR code for Android Package file, or publish to gallery. Free PL at mobile-csp.org for Computer Science Principles in 2016. One of 4 AP CSP courses endorsed by College Board. Lenovo Scholar network at j.mp/MITAppInvResources or https://docs.google.com/document/d/12izUX1d3Fli9zdmFN_5QNpZHdDprsT6gKH768_17_1s/pub has resources. This morning I met Maurico. He’s probably 11 or 12, and he’s from near Mexico City. He’s built an engine that runs on compressed air, and it’s made of wood because that’s easy to work and there is no combustion involved. He realises that internal combustion engines are polluting Mexico City, so this one doesn’t release any pollution where it operates (the air is compressed using energy generated outside the city). It doesn’t overheat as expanding air decreases in temperature. He’s figured out that air storage tanks are probably not a big deal as people already know how to make tanks to hold compressed gases. Maybe next year Maurico and his mates will design a little car that is powered by this engine. 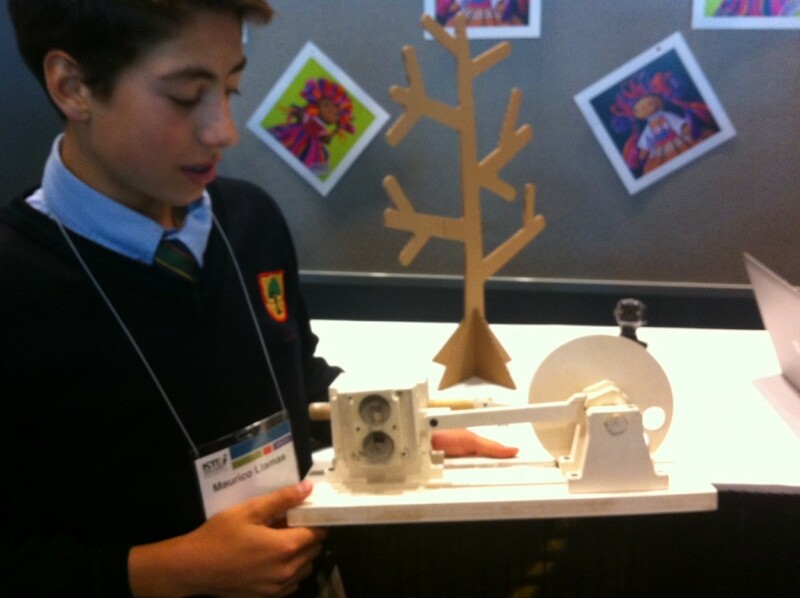 Maurico with his compressed air engine made of wood. Introducing Computer Science while Building Socially Useful Apps. The purpose is to introduce teachers to Computer Science through mobile app development. Additionally, the workshop will introduce participants to Mobile Computer Science Principles (CSP) which is an NSF-funded effort to train teachers to teach computer science. The Mobile CSP course is a course that engages students in building mobile apps with App Inventor. The workshop will provide participants with an overview of Mobile CSP training including a hands-on introduction to App Inventor and a representative sample of CSP-based lesson plans, assessment materials, and other resources. Mobile CSP training will be available for free to all high school teachers in summer 2015 through an online course. Attendees will be provided information about getting involved in the summer 2015 training. Participants will be provided with an Android mobile device to use during the workshop. Those who have their own Android phones or tablets can use them if they choose. All of the pedagogical materials presented in the workshop, as well as all of the materials used by the workshop presenters in their individual courses, will be made available to participants under a Creative Commons license. Materials will include sample syllabi, online video lessons, homework and programming assignments, sample quizzes and exams, and grading rubrics. Other critical information: While originally developed and hosted at Google, App Inventor is now based at the Center for Mobile Learning at MIT (http://ai2.appinventor.mit.edu). It is currently supporting almost 1 million individuals who have created more than 2 million projects. The MIT server currently hosts more than 5000 active users per day. 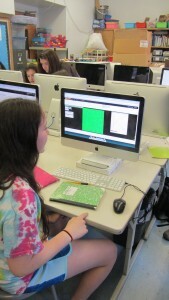 A growing number of teachers at all levels, from grade school to university, are using App Inventor in their computing courses. IV. Pedagogy: how differentiation, peer programming, assessment is implemented in the classroom. (20 minutes). Built app in the session to let people text teacher, then the app selects a random phone number based on numbers received, sends text to winner. Cloud based service – generates bar code that can be used to download app to device if the device has a code reader installed. CS Principles – new NSF funded AP course for 2016/17, AP CS Principles largely a failure based on Java programming, way lower enrolment compared to other AP projects. College Board keen to change this. Aiming to increase girls and under-represented minorities. Emerrgency messenger- issues lockdown alert, fire alert, app allows principal to alert all in building with a predefined or custom message. App Inventor is Open Source and course promotes open licensing via a gallery. Entrepreneurial aspect is additional – on their own time. Android marketplace is open. Some kids have had over 1.000,000 downloads. Kids get into this on their own. 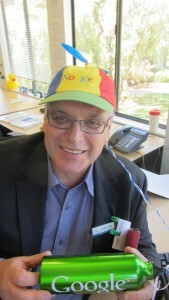 Jim Vereskis has apps written by students for his own daughters. Socially useful apps – Hartford mayor spent some salary budget to develop apps for city 0 navigate public buildings, golf course, “HMTCA mobile CSP” https://sites.google.com/site/hmtcamobilecsp20142015/home for examplss of students work. Activity on parity and data integrity. Mobile CSP has been funded so teachers can participate via MOOC – need 10,000 more CS teachers in schools. Evidence is that this works well with underachieving students. DoE is primarily a Microsoft-based environment. However the apps environment at this point is not well-accepted in comparison to the two dominant apps environments (Apple’s iOS and Google’s Android/Play environment). The Apple environment is very popular but its focus on quality control and high-value product might not fit well with the model of students developing, failing and modifying product. The Google platform, especially when combined with the MIT Apps Inventor 2 development tool, is aimed at students and can be used by primary students upwards. There is also a lower entry threshold and the ability to develop “play” apps and readily share them. An Android device is not needed, there is an emulator and the actual creator program runs on Mac, PC and Linux computers. The materials available in the CS Principles course could be used from upper primary to year 10, and possibly beyond. They include a useful and supported suite of tools at no cost, and are well worth considering. TinkerCAD is most common tool for developing 3D models. In some schools 3D printing is managed by librarians. Seems they have seen the writing on the wall. Technical support for 3D printer – is this an issue? MakerBot seems to hold up OK – some others not so well. Design process – ADDE framework https://en.wikipedia.org/wiki/ADDIE_Model is used widely. Design a coin of your face. Time for makerspaces is seen as being at the expense of “serious” topics, that is those that tested with standardised tests. Online learning online.= limited, teachers need to experience it hands-on. Makerspace kits are issued in some school districts, but teachers have to attend PD. This event is now been running for several years and its structure is as interesting as the content. Model for the unconference – facilitated discussions, not presentations. Topics are allocated to timeslots and locations, an hour each. Then people choose which to attend, discuss. Where a group exceeds 20 people it is split in two. People vote with their feet and move between sessions. NO commercial pitches are allowed. The day long nature means people can still wander off and attend other sessions, returning to the sessions they area interested in. Group photo is taken part way through. 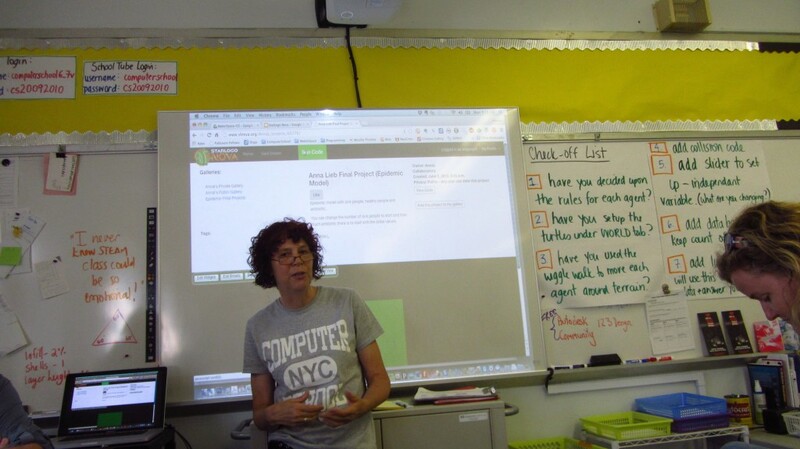 Today included a visit to the oddly-named Computer School in Manhattan, to see Tracy Rudzitis and her work with Primary classes and technology. This included a number of coding classes, including the use of Starlogo Nova to simulate population dynamics for predatpr/prey situations and infectious disease propagation. The modelling was quite straightforward using this tool, and students were quite fluent in describing the role of randomness and variables in this modelling. 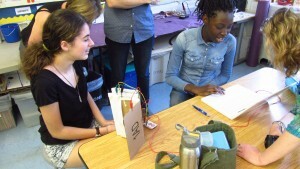 Tracy has also set up a lunchtime makerspace where students were building interactive toys and devices using MaKey MaKey devices and home-made sensors. This included a digital book that used foil on pages to trigger various actions as the reader turned pages. Primary and middle school students are quite capable of developing computer models when suitably scaffolded and when tools such as Scratch or Starlogo Nova are used. It is very easy for digital technologies to become the province of a computer specialist. The fact that mathematical modelling was happening here and not in a mathematics or science class seems odd. In 1983, a new school was born in the basement of the O’Shea complex on W. 77th Street. Premised on the notion that technology could be a vibrant teaching tool, The Computer School was one of the first schools to integrate computers into the classroom while providing a rigorous, innovative and broad-based curriculum to its students. Today, the school’s premise is a given: computers are an integral part of the classroom – and the school’s name, which reflects its pioneering philosophy, tells only part of the story. While it’s true that Computer School students receive regular instruction in cutting edge digital media, they are also exposed to a richly inter-disciplinary curriculum that excites their minds and touches their hearts. And as part of a highly diverse community that hails from many different cultures, races, religions and economic backgrounds, they learn invaluable lessons from each other – as well as from the school’s challenging academics. I think it is fair to say that the influence of things like Common Core standards have meant that computing now is seen as less critical than some of the other curriculum areas at the Computer School. Digital Technologies in the Primary sector needs to be integrated into current and traditional curriculum areas rather than be seen as an additional task. With careful planning, Digital Technologies and Design and Technologies could be integrated for teaching purposes, but assessment remains problematic. Being proficient in one need not indicate proficiency in the other. The assessment/reporting expectations need some more thought. Despite the first point, mandated testing and reported performance measures can skew a curriculum very seriously, by messaging that some areas are more important than others. This has implications for areas such as Design and Technologies and Digital Technologies (and possibly others). After numerous discussions with the educators and entrepreneurs we have met so far, a common theme has emerged. 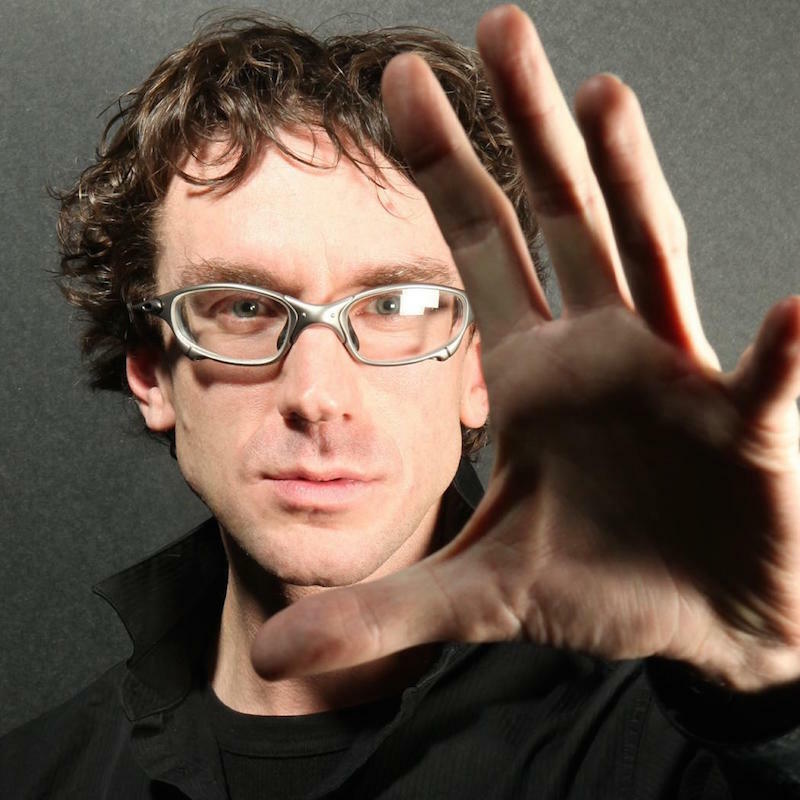 The conversation with Pablos Holman in particular contrasted his experience of failure in hacking and in invention (in which it is a critical component) with the role of failure in schools (where it is generally something negative and to be avoided). Possibly we need to rethink this. Our most “successful” school students are often those who rarely experience failure, yet dealing with failure and using it productively is critical in innovation. Maybe failure needs to be part of their educational experience? The anecdote was told by a long-time associate of Edison’s named Walter S. Mallory. Edison and his researchers had been working on the development of a nickel-iron battery for more than five months when Mallory visited Edison in his laboratory. Pablos is a futurist, inventor, and notorious hacker with a unique view into breaking and building new technologies. He works on invention and design projects that assimilate new technologies – making wild ideas a bit more practical and vice versa. He helped create the world’s smallest PC; 3D printers at Makerbot; spaceships with Jeff Bezos; artificial intelligence agent systems; and the Hackerbot, a Wi-Fi seeking robot. He works at Intellectual Ventures. 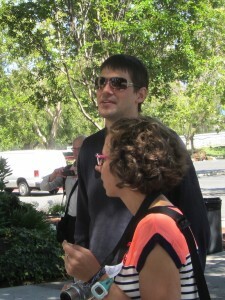 Pablos described a number of bizarre inventions that his company is working on including a nuclear reactor that uses waste from other reactors, an entire book on scientifically produced food recipes, a tracking system that detects female mosquitos and kills them with lasers, and an attempt to eradicate malaria by detecting waste products of parasites in humans. More importantly, Pablos described how a mis-spent youth was the best preparation for this work- that he was able to teach himself to make technology do things that it was never designed to do, to learn from failure, to pursue a passion and to think beyond the boundaries of school. Invention and innovation require “T Shaped people” – people with a deep knowledge in one field, but a broad knowledge across many fields. And the ability for these people to interact with others without conflict or miscommunication. Josh Garcia – Deputy Superintendent,Tacoma Public Schools (winner of 2013 Outstanding Young Educator ASCD). Josh is an incredibly passionate educator who has transformed Tacoma Public School from a system that was derided for its low standards to one which has significantly improved measures of performance. improving the academic achievement of students. creating a system to track student performance data that allows early intervention when students fall behind. establishing a series of detailed public benchmarks to track the district’s performance on its strategic goals in academic achievement, safety, early learning and partnerships. giving students more ways to gain credits toward graduation. He is keen on flexible learning approaches and has no problem with standards and Common Core (WA’s standards mapped onto CC about 80% anyway), as long as they aren’t seen as the only measure of performance. Josh has changed the policy around student enrolment by making the default situation that students are enrolled in the highest standard course of which they are capable, and the families have to actively opt out rather than opt in. 2014 – District has 78% graduation rate. The activist fundraising group is now almost unnecessary, as the situation is now so different and the purpose is unclear. The District profile is fairly needy. About 65% qualify for free lunch, and there is about 30% mobility. development of urban hubs has effectively pushed less affluent families out of the larger cities to the fringes. Consultation and agreement was undertaken in a (very) public process where accountability was paramount. This ensured that every partner had a clear role and an undisputable measure of success. The measures of a whole child were developed via an accordion process that went back and forward between stakeholders, eventually resulting in a set of metrics. They are now looking at sharing data between agencies – eg this student has these social services, so we should know that and include it in our dataset. Shaun explained the data warehouse project and the way in which assessment data was imported into the District’s systems. Importantly teacher assessments (ie every teacher markbook) is online and the data uploaded – it’s not just summative data from reports, it’s close to real time and is visible to parents. Shaun’s team worked with Microsoft education specialists to devise ways for recording data on all the measures agreed upon as measures of the whole child. The data systems also now track verification for students into their next institution. Agreements between universities on what was actually required for entry resulted in a guarantee that any student who met them would be admitted. See https://customers.microsoft.com/Pages/CustomerStory.aspx?recid=20703 for more on this. Thanks are extended to Josh and Shaun for their willingness to share their experience and expertise. A very engaging and powerful session. When conversations and agreements are negotiated in a public manner, all parties are driven to abide by them. Wise use of the media and public channels such as newspaper and TV, along with open use of data, can be very powerful. Data is transparent and neutral. Data transparency is a way to build trust and accountability. Public discussion of student and school achievement data appears to be valuable. At present we gather less data than Tacoma. In particular, we have no systemic way to store teacher markbook level data and neither the system nor even school principals have a way to see these markbooks or analyse them in a meaningful way. If we intend to use data for learning analytics, the data has to be in a meaningful and consistent form. That is, a common way of recording it is required. It is impossible to compare a 17, a B-, a Somewhat, 48% and a smiley frog. Better use of the media including social media, radio, newspaper and TV could bring greater transparency and accountability. We need ways to track where our students go. We seem to have a lack of data on where students go on completion of education, and universities seem unaware of the source schools for their current students. We should be able to fill that gap. We visited Karen Cator and Chelsea Waite of Digital Promise, a company that works at the intersection of education leaders, researchers, and learning technology developer to improve the opportunity to learn for all Americans through technology and research. She lead a discussion of how technology can help empower students and families, reduce social inequity and help people move from seeing technology as entertainment to being a tool for life. 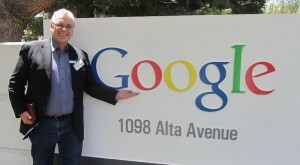 Yes, we toured Google! 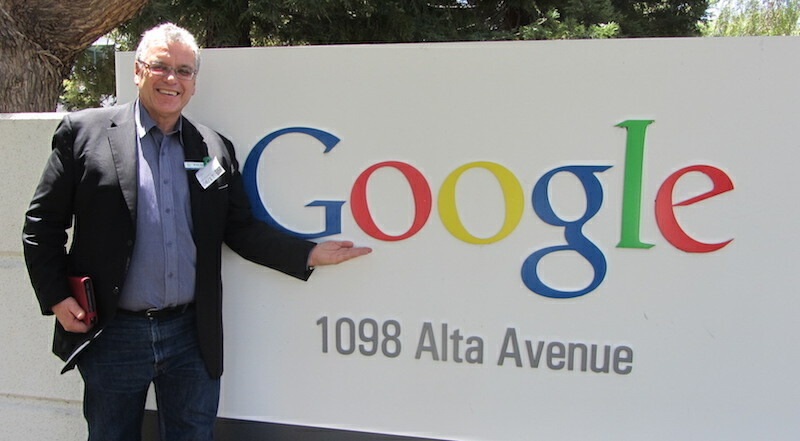 Here we had a tour of the Googleplex and amazingly the guide was Aaron Eisjdenberg, a former Tasmanian who studied at Utas and then went on to work for a company which developed an airline flight shopping system and then ended up at Google. The campus is of course iconic but interestingly it has no real reason to exist where it does apart from proximity to other technology companies. There is no natural resource needed, and the proximity of Stanford etc is largely incidental as software engineers come from all over the world. Aaron added that he didn’t find working at Google significantly harder than working in some of the previous roles he has held, but it was more rewarding. 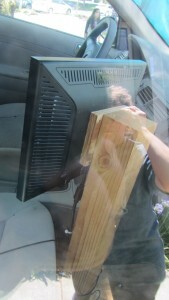 A Google Street View car is on display, and interestingly the passenger seat area holds a monitor secured in a high -tech way; with a block of pine wood. Dan Rivera, marketing manager at Aruba, discussed the importance of planning strategically for WiFi in schools, to cater for BYOD and personalised learning. The overall issue of bandwidth and internal networking is as big an issue for US schools as it is for Australian schools. So we circled Infinite Loop and had a look around. Programmers will of course question how we escaped Infinite Loop. We leave this as an exercise for the reader 🙂 .